↑ Seelye, Katharine Q.. "Bush Celebrates Easter at an Outdoor Service", April 16, 2001. Retrieved on July 6, 2009. "Republican National Committee biography". Archived from the original on April 14, 2007. 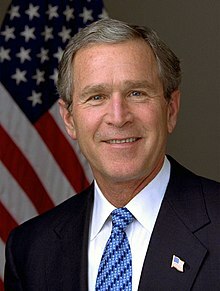 George W. Bush photos – History Channel collection of presidential photographs.